The influence of incorporating dry-heated wheat bran, at 5, 10, 15, and 20 g/100 g levels with dry-heated wheat germ at 3 g/100 g level, on fino dough rheology and bread quality was studied in comparison with fino bread containing unheated fractions, and white wheat bread. Dry heat treatment showed insignificant effects on the chemical composition and the dietary fibers of wheat bran and wheat germ, but was effective in reducing lipase activity by half in wheat bran, and by 100% in wheat germ. Dough containing dry heated fractions lowered the water absorption, extended the development time, strengthened the protein network, and increased the stability time, starch gelatinization, hot-gel stability, and starch retrogradation. Fino bread had larger loaf volume, darker crumb color, and lesser firm, gummy, and chewy texture. 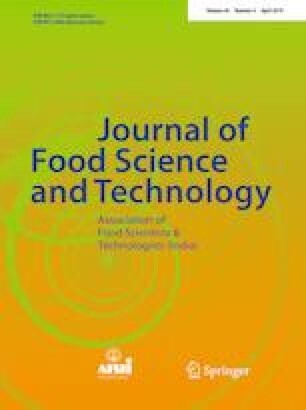 Sensory acceptability of fino bread loaves containing heated fractions indicated significant (P ≤ 0.05) improvement in taste, flavor and overall acceptability scores. Fino bread provided 9.0 to 21.5% of the dietary fiber intake (DFI) for the adults, showed significant loss of phytic acid (30–34%), had higher significant total phenolic contents (109.2–198.2 mg GAE/100 g), and antioxidant activity (40.17–47.46%). Levels of 10 and 15 g heated bran with 3 g heated germ/100 g showed acceptable results among all studied characteristics. Dry heat treatment could be applied on wheat bran and wheat germ to mitigate their negative influences on dough rheological behavior, and to deliver functional fino bread to consumers, with more dietary fiber, high-quality nutrients and antioxidant activity.